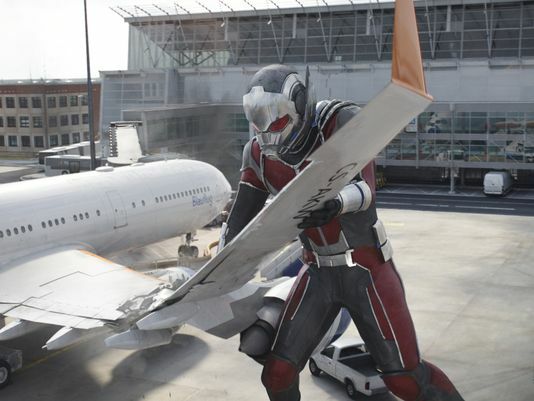 Yes, Marvel’s Captain America: Civil War has been out in the U.S. since Friday (and a lot longer than that overseas), but even before the film’s release many fans already knew that at some point during the superhero smackdown, Paul Rudd’s Scott Lang/Ant-Man was going to reverse his shrinking ability and become Giant Man. Now that the cat’s out of the back though, USA Today has unveiled the first official image of the big fella in action. If you’ve seen the movie (and if you haven’t, what the heck is the matter with you? ), you’ll know that Lang volunteers to attempt the “big” distraction that Cap and Bucky need to make their escape, and at great risk to himself, vastly increases in size to become Giant Man. In the photo above, he’s seen tearing off the wing of a plane to use as a makeshift fly-swatter – except this time, his target is actually a Spider. Those of you who’ve seen the film will know that it’s easily one of the highlights of the airport battle scene, which itself is probably the highlight of the entire movie. Captain America: Civil War is currently playing in theaters everywhere. Check out the photo above and let us know what your favorite scene of the film was by commenting below.